A healthy salad with lots of greens! For the sauce, cut the chives into fine rolls and coarsely chop the basil and parsley leaves. Crush the garlic and mix all the ingredients thoroughly. Cut the VEGANSLICES into thin slices and the carrots into thin strips. Slice up the white cabbage, cut the spring onion into small rolls and the mushrooms into slices. Cut the salad up into small bits and cut the chicory into fine strips. 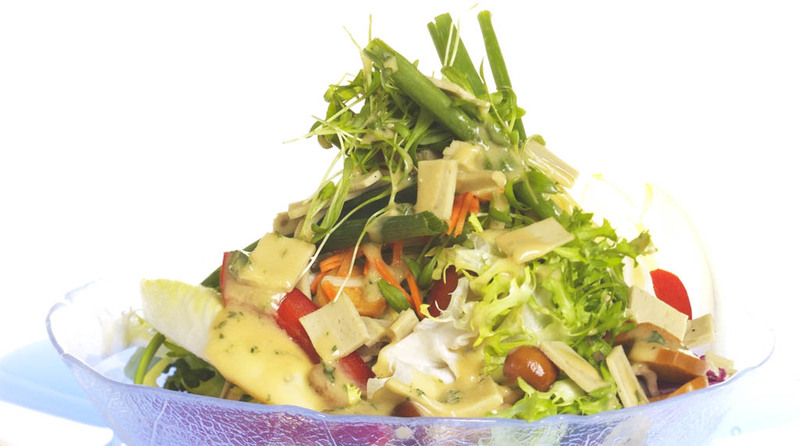 Place the washed and cut salad ingredients in separate layers in glas bowl. 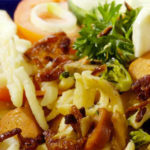 Finish off by garnishing with the chicory strips and the sprout mix on top. Pour the salad sauce over the salad. Serve with oven warmed Parisian white bread.